Sometimes when you install a storage device on your PC, Windows seems to assign it an arbitrary drive letter, as shown below when I plugged in my USB flash drive. To make matters worse, Windows assigns a different drive letter for each PC that I plug the flash drive into. This plays havoc with applications that run directly from the flash drive. Fortunately it's very easy to change a drive letter. 1. Select Start | Conrol Panel. 3. Under Administrative Tools double-click on Computer Management. 4. 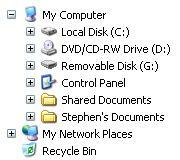 In the Computer Management window that appears, under the Storage branch, click on Disk Management. 5. In the Computer Management window, in the top section of the right panel, right-click on the letter you want to change. 6. In the popup menu that appears, select "Change Drive Letter and Paths..."
7. 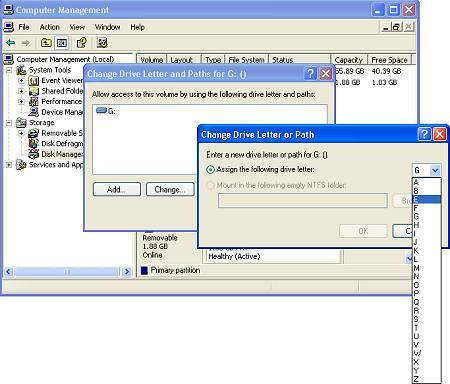 In the "Change Drive Letter and Paths" dialog box that appears, click on the [Change...] button. 8. In the "Change Drive Letter or Path" dialog box that appears, select a letter from the drop-down list. • I would recommend to NOT use the letters A or B because these letters are reserved for legacy floppy drives.